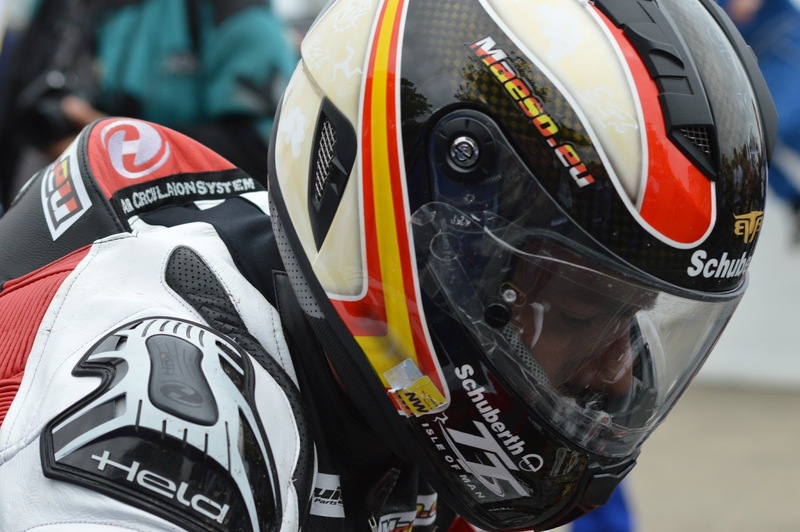 It is difficult looking back at this year’s Isle of Man TT and knowing exactly where to begin. A bountiful feast of road racing was had by all. There was the Mediterranean weather baking every inch of tarmac across the thirty-seven and three quarter mile circuit, there’s the amazing people and personalities you will undoubtedly encounter, each and every one sharing the same passion and reason for being on the island at that time. And all this takes place amid the backdrop of a beautiful historic island nestling off the North-West coastline of England. Many have said or at least raised the question as to whether this was the best TT ever? That’s difficult to say, but let’s just say it was exceptional. The TT attracts a global following and has certainly elevated its appeal following the remarkable Guy Martin film Closer to the Edge, in 2010. Spend a day in the media centre with TT organisers Paul Phillips and Simon Crellin and you will see exactly just how well they manage the continuous stream of journalists, photographers and film crews from around the globe. It’s a task of epic proportions and one that is administered so efficiently well. No matter where you come from for the Isle of Man TT, the excitement and thrill begins the moment you commence your journey to the island. You’re booked on the Steam Packet and set to board the famous Ben-my-Chree. The ship looms in the darkness at Heysham, with swarms of bikes around the dock, like bees heading to the hive. The make shift beer tent located on the entry ramp offers a welcome respite ahead of the journey, no better place to enjoy a beer (or three) and watch a production line of two wheeled machines flowing into the hull of the vessel. On board ship, TT guides and copies of MCN are in plentiful supply as fans prepare their practice and race schedules, choosing he best vantage points to see the racing, where to go in the evening and, of course, who will be the King of the Mountain for TT 2013 all form the main topics of conversation. 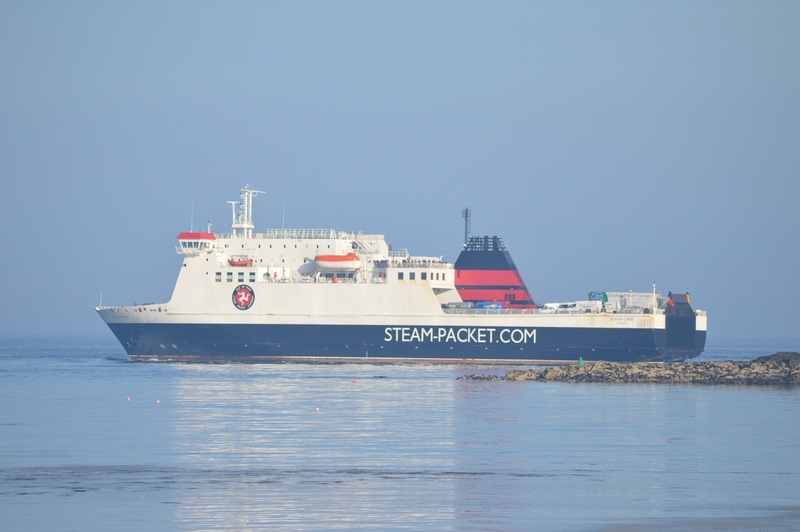 It’s a busy crossing, seats are at a premium and bodies adorn the floors on every deck with leather clad riders taking advantage of any available space that will allow for some rest ahead of what will inevitably be a busy day when the ship ports at Douglas. After some broken sleep, you make your way to the outer deck, stepping over bodies on route and treading carefully so as not to wake your fellow bike enthusiasts. With an early morning chill that bites as you climb the steps to the upper deck, the sun begins to wake and reveal the jagged outline of the Lake District to one side and the harbour of Douglas to the other. People reach for cameras and phones to capture the moment of arrival at this road racing mecca. This is Lourdes for road racing fans. It’s where you must go to follow your religion. Maybe you are one of the many devout followers who make the pilgrimage annually. Perhaps you’re a first timer like me, looking to pay homage to these gods of the road. One thing’s for certain, spend any amount of time on the island over the fortnight and you will be converted to this holy church. Of that you can be guaranteed. Teams of bikes congregate around the terminal at Douglas, consulting with maps and GPS systems before assuming their adventures on the island. It’s 6am and the place is already breaking into life, with the sound of bikes, occasionally broken by the distinct sound of a Ducati thumping down the promenade. You’re here. This is it. So let the road racing begin. Having found the base for the fortnight, the first port of call was the famous TT Grandstand and the media centre. A welcoming sight, as someone you regard as a part of the TT furniture opens the door and greets your arrival. That would be Richard ‘Milky’ Quayle, an essential guide for every race entrant alongside John Barton. Choose your location in the centre and make sure you’ve got all the tools you’ll require for the week, including the important pass and photographers bib. These are the tickets to grid access, winners enclosure and all important rider interviews. TT organiser Simon Crellin ensures you have all you need. While he was not my guide during the stay, he’s someone who takes care of your requirements as a TT journalist and photographer. First stop is the Milwaukee Yamaha garage to catch up with the team. It’s been a few weeks since we’d been together and you do actually miss them. Following the BSB round at Oulton Park, the team headed to the North West 200, which was eventually cancelled due to the torrential rain that swept through the region. 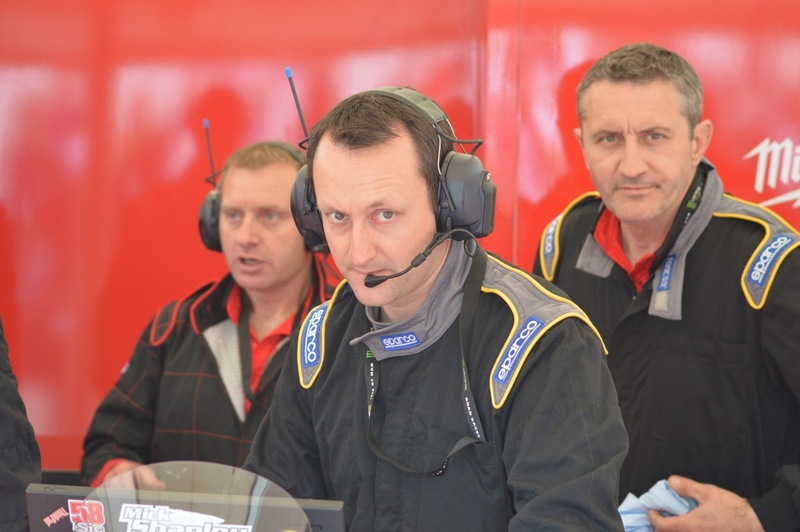 Mick, Jez, Pete, Steve, Andy and the rest of the guys are getting everything prepared for the busy schedule that lies ahead. No sign of riders Conor Cummins or William Dunlop. A light breeze catches the Milwaukee Yamaha flags, which ripple in the blue sky above the garage. A crowd has gathered to watch the team preparing the steeds that will carry the riders around the famous Mountain course. There’s a scurry of activity in the garage adjoining the Milwaukee team. Nineteen times TT winner John McGuinness signs his book for fans, as wife Becky feverishly tries to keep up with the demand for this impromptu signing session by the King of the Mountain. This was my first experience of many during the 2013 TT, where you actually see just how much time the Morecambe Missile spends with his loyal army of fans. The forty-one year old epitomises the TT and everything it stands for. Not just for his exploits and achievements on track, but for his humble approach to fans. I’ve been fortunate enough to know John and his family, but even now, I still see him as a God of the roads. He is a humble man and very approachable, but one does consider whether he actually fully understands and appreciates the magnitude of his achievements on the island. This is no ordinary race paddock. It’s regimented with the factory teams gaining superiority by their close proximity to the Grandstand and track. You then work your way in waves as you descend down to those privateer teams, who beg and borrow to fulfil their TT dream each and every year. Makeshift washing lines, B-B-Q’s, scooters, bikes and race worn tyres scatter the camp. Practice sessions are still underway ahead of the opening Dainese Superbike TT race on the Saturday. All very important as riders across the various classes take advantage of some valuable time on the technical course that commands respect, skill and the utmost of concentration from the riders. 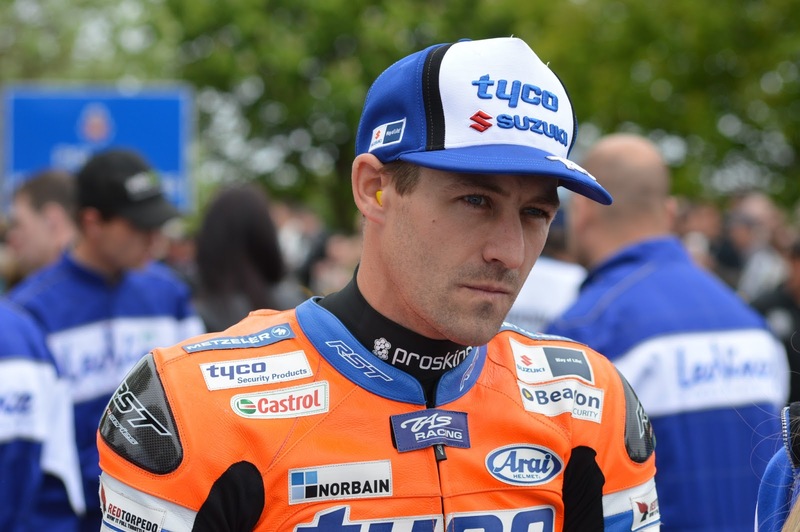 None more so than TT newcomer Josh Brookes who has reportedly completed in excess of one hundred laps of the course on a road bike or car in the weeks leading up to the event. Everyone had been impressed by the thirty year old Australian during his build-up to the event and preparation to take on the course. Learning this unique road racing event is key. Understanding each of the six sections that make up the historic circuit and the myriad of technical apex corners that must be negotiated over the thirty-seven and three quarter miles is essential. It takes a special kind of individual and when it comes to the homework, the likeable Tyco Suzuki rider had certainly crunched the books, so to speak. Virgin Trains have never been my thing. Thankfully there is no sight of them on the island. Cramped, smelly and always delayed, it’s something I try to avoid. However a few months before the 2013 TT campaign, I was fortunate enough to journey to London in a very quiet carriage with the ‘Morecambe Missile’ himself. Talk about whet the appetite. I described the experience to close friends and bike fantatics as, “if Carlsberg did train journeys”. If they did, well this would have been it for sure. It was during the trip, as McGuinness headed to the Excel bike show, that he outlined his admiration for Brookes and how dedicated he felt the Australian had been to approaching the TT. A future winner of the event was the question I posed to the then nineteen times winner, who nodded with agreement. If anyone knew the course, its runners and riders, McGuinness was your man. A mutual friend that we share once told me just how knowledgeable the Morecambe man was when it came to the course. A photographic memory of gargantuan proportions housed on those wise old shoulders. McGuinness knew the cambers, man-hole covers, grids, kerbs and tree lines in the same way he knew every component and curve on his trusted Honda Fireblade that had continually carried him to continued success. I like many others would hope that 2013 would something for the forty-one year old from Morecambe. 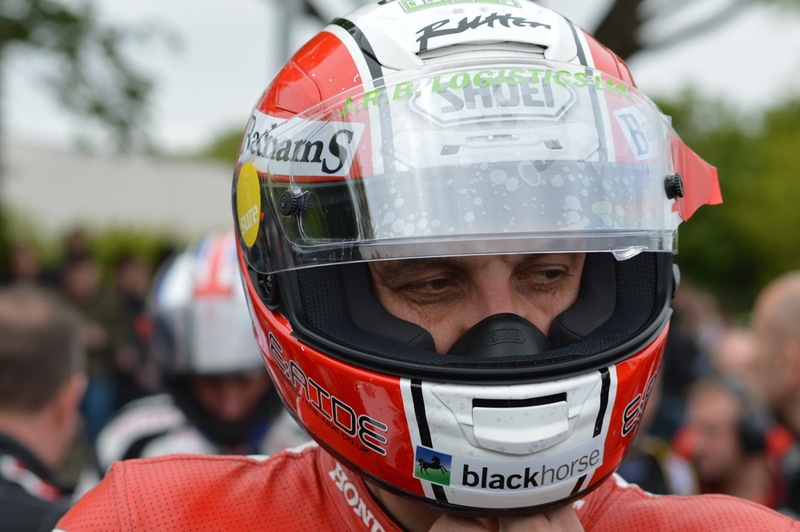 In 2010, that was the first year that McGuinness had failed to even mount the podium and questions surfaced as to his continuation on the island. But the following year, victories in the Superbike TT and the Senior road race took his tally to seventeen. He then notched two more credits in 2012 with a victory in the Superbike and also the Superstock TT, a class which had previously eluded the Honda rider. With a total of nineteen TT victories to his name going into the 2013 campaign, it would take a brave man to bet against more success on the island. There was one question however. A twenty-four year old from Ballymoney Northern Ireland had other ideas about the reign of McGuinness on the island. 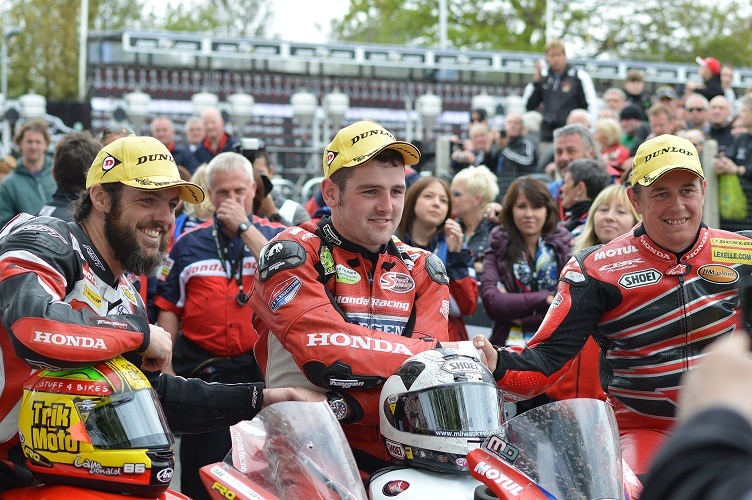 A leaner, more agile and somewhat matured Michael Dunlop was intent on writing a new chapter in TT history and 2013 would unfold to be a story of the ‘Old Pretender’ and the ‘Young Pretender’. Dunlop was the new suitor about to lay claim to the throne and take the crown from the reigning King. McGuinness was the old hand and many questioned whether he would abdicate or stand his ground. 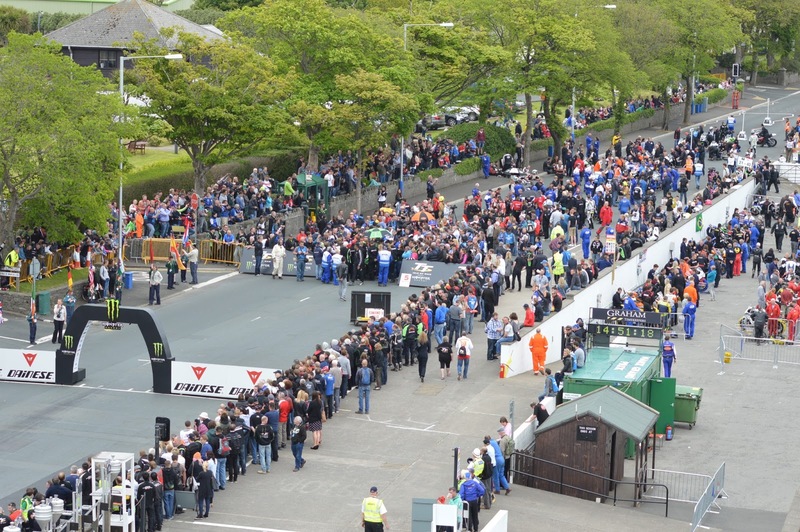 The Dainese Superbike TT race would be the opener on the Saturday and cover six laps of the mountain course. While McGuinness had topped the qualification on the Thursday prior to the race with a 129:32, it was Dunlop with the combined sessions setting the pace with a 130:895. McGuinness and Dunlop would be the only two riders in the field to make the 130mph average speed as the combined qualifications were calculated. A few weeks earlier I had joined the Milwaukee Yamaha team at Cadwell Park for a test that would include both the BSB riders, James Ellison and Josh Waters, accompanied by their road counterparts, Conor Cummins and William Dunlop. 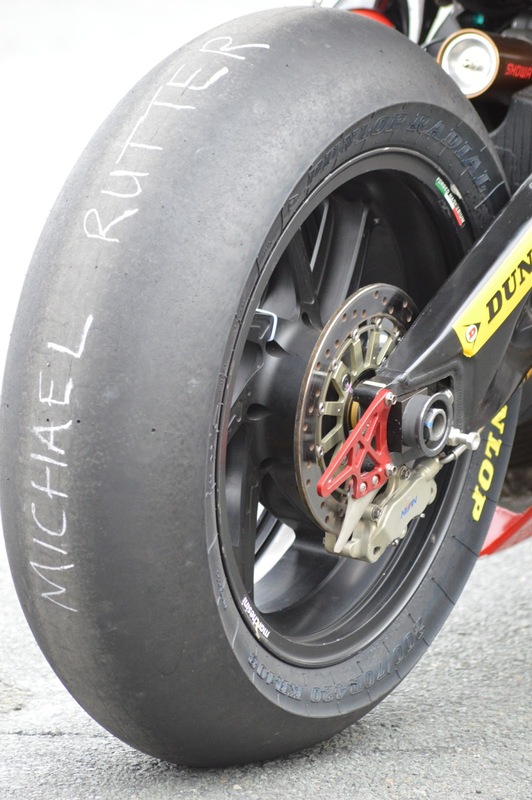 I was there to interview the road racing duo and it was now that I took stock of the discussion that I had with the older Dunlop brother, where he told me that 2013 would be the year for Michael. The rider could adapt across the classes, he had trained hard and become so focussed on success, that success at the TT was almost assured. Before heading to the grid, TT organiser Simon Crellin offered me a rare treat to view the activities from the top of the Grandstand. An impressive sight that allows you to gain a birds-eye view over the paddock, the grid, the famous timing board manned by the local scouts and down towards Glencutchry Road and the drop that would take the riders down the famous Bray Hill at speeds in excess of 170 miles per hour. If you have only ever seen Bray Hill on the television, nothing can prepare you for the sight in real life. The height and the gradient of this public road surrounded by houses on either side, where riders quite literally feel they are dropping off the face of the earth is truly a sight to behold. Add the riders to the mix and it is quite literally an unbelievable sight to see. Making my way down from the Grandstand and onto the congested grid, I see a rather pensive looking Josh Brookes and can but wonder whether the task facing him has now truly registered. The Tyco rider pauses for thought before moving to his machine and sharing a light hearted word with his mechanic which seems to relax the rider ahead of his first TT race. TT Legends and Royal Air Force Reserves Honda rider Simon Andrews also looks pensive as he begins the new campaign. 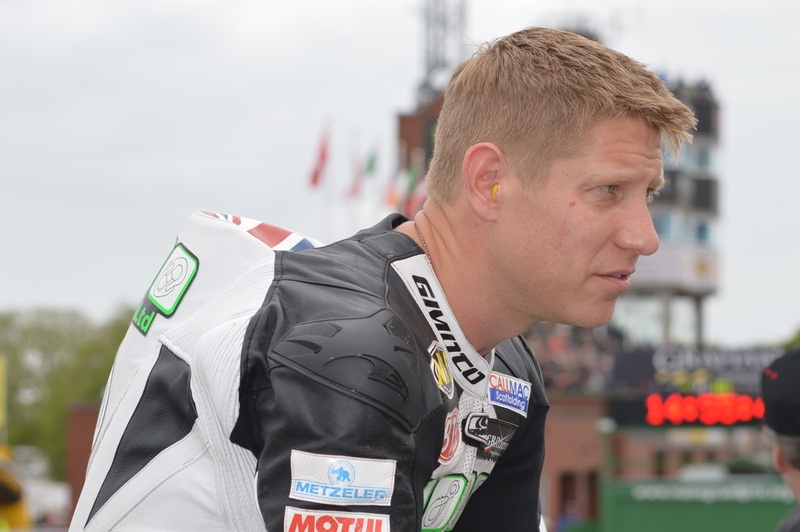 In his third year now having made his debut in 2011, the twenty-eight year old has been bitten by course on more than one occasion and a crash in 2012 during the opening race confined the rider to watching from a bed at Nobles Hospital. He’s a tough character, made of steel and he’s fought potentially career ending injuries to haul himself back into the saddle. My admiration for Andrews is unwavering and he has a determined fighting spirit that is second to none. He’s also a very nice guy off the bike. 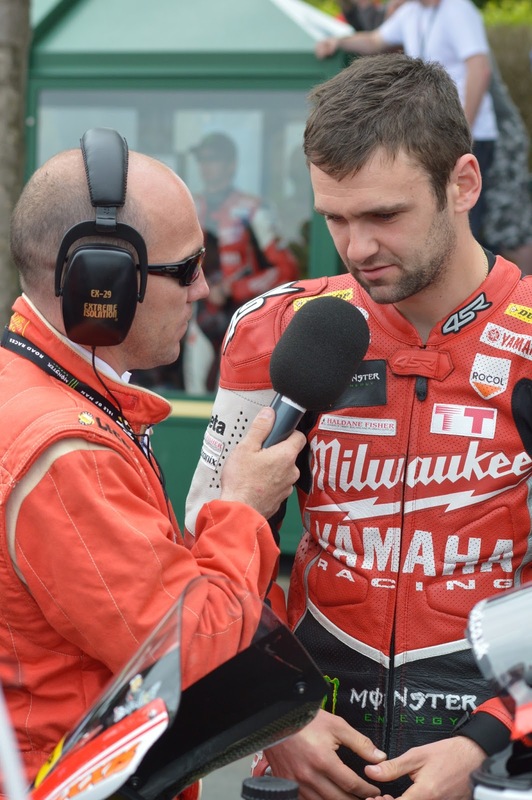 Milwaukee Yamaha rider William Dunlop is being interviewed and looks as relaxed as ever. He’s an extremely laid back individual and epitomises the true nature of road racing, something I would discover in greater detail as race week unfolded. Lincolnshire rider Gary Johnson sits calmly on the wall overlooking the paddock area exchanging words with fans and journalists. You’re immediately drawn to just how relaxed some of these riders actually are ahead of the race. Johnson acknowledges me as I pass by before taking to his Honda Fireblade just metres away. This is an important year for the rider. Although he’s teamed up with Jack Valentine to ride the 675 MV Augusta, the former electrician who has one TT win to his name, has also self-funded a huge part of his 2013 campaign. Johnson is determined and can battle with the best, so he’s certainly a rider you can never discount in any class. 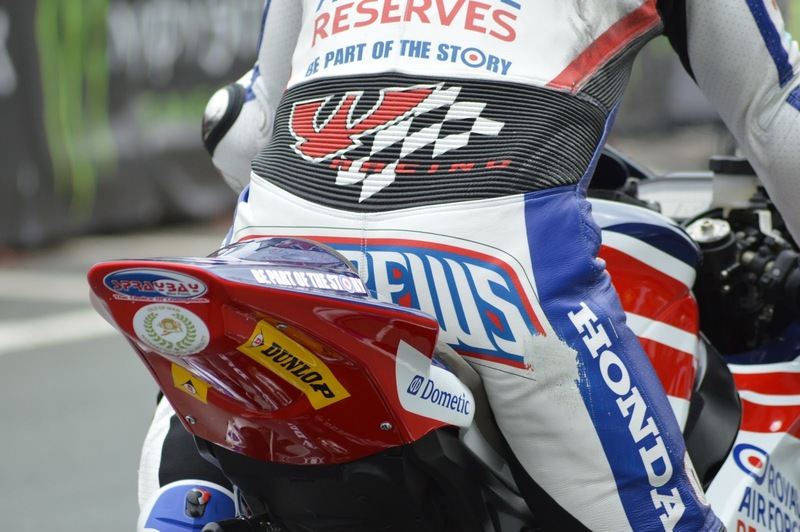 Marking the 30th anniversary of the legendary Joey Dunlop’s first Isle of Man TT win with Honda, former team-mate John McGuinness would contest the race wearing tribute Dunlop livery. I watch closely as the Morecambe man, surrounded by an army of fans, VIP’s eager for an autograph and camera crews all scramble for a piece of the modern day Mountain King. It’s a fitting tribute to the most successful TT rider in history and perhaps no better person to lead the many tributes. 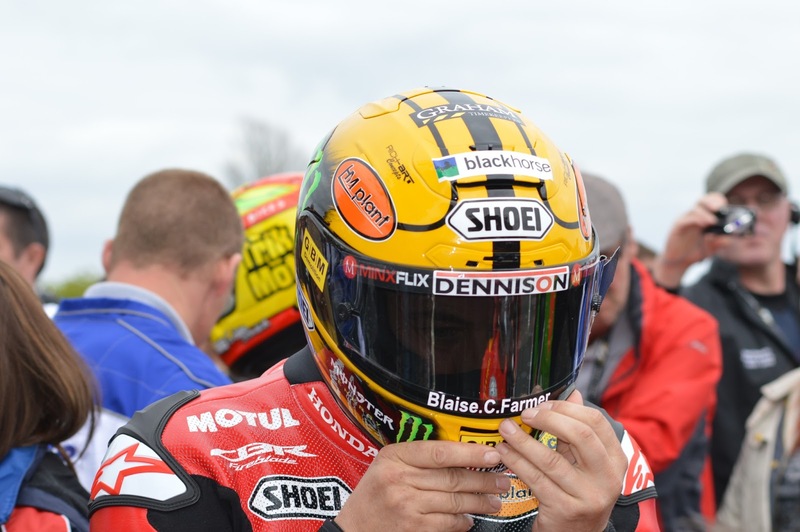 McGuinness prepares the stunning Shoei helmet, with a design by Rich-art that reflects the distinctive Joey yellow, which road racing fans the world over grew to recognise during the twenty-six times TT winners highly successful career. 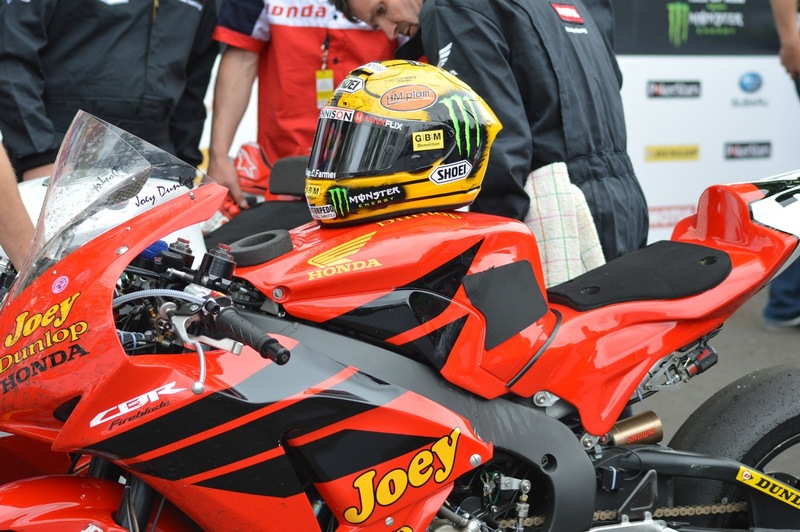 “It’s an honour to be asked to take part in the tribute to Joey,” says McGuinness. “He was and still is the most famous road racer of all time and although it’s thirty years since his first Honda win, he’ll never be forgotten. Seeing the tribute design for the first time brought back all the memories of being Joey’s team-mate” he said. 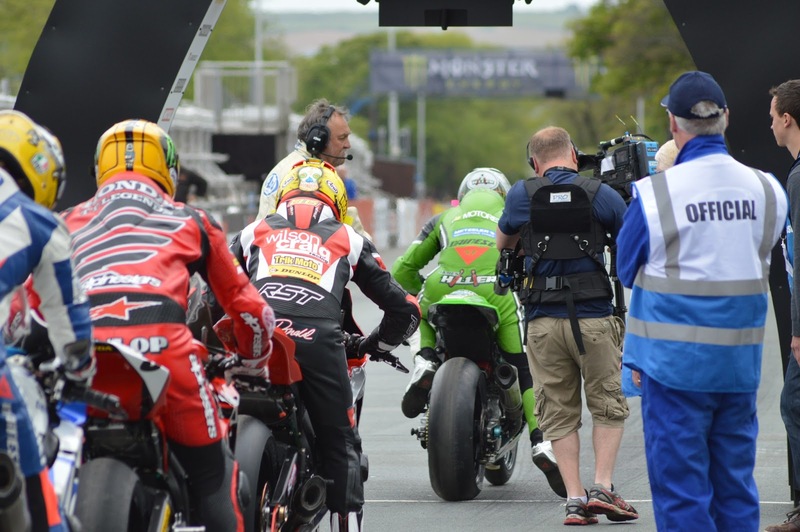 James Hillier begins to make his way toward the start line, as McGuinness makes a last minute adjustment to his visor. The Young Pretender Dunlop breaks a powerful determined stare to cast a wave to family and friends. Australia’s fastest plumber Cameron Donald receives a kiss from girlfriend Kaz (Anderson) and then moves his bike slowly behind Hillier, who now prepares for countdown and the customary shoulder tap from the marshall. This is what we came for and it’s hard to contain your emotion or excitement, as the Hillier gets the race underway on his Kawasaki. True to form and in line with traditional McGuinness TT rituals, this brickie from Morecambe “who can ride a bike” rises from the race position to wave to kids Maisie and Ewan sat in the main stand. Tyco Suzuki rider Brookes watches closely as McGuinness heads off for his opening lap of the course. 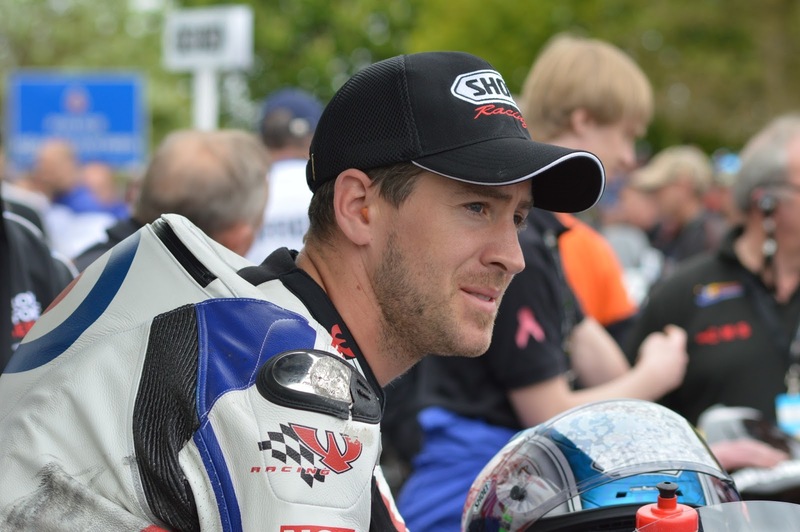 Watched closely by Philip Neill, Brookes moves ever closer to his first TT start. Former Olympian and Splitlath Redmond team owner Derek Redmond savours the atmosphere of the opening race and while his rider, American Mark Miller works his way towards the start. The team will run a second machine ridden by Cheung Wai On who had received expert guidance from Milky Quayle in the days leading up to the race, with the aid of a translator I might add, Milky’s not that talented or multi-skilled. The Milwaukee pairing of Cummins and Dunlop make their way through the gathering behind Dan Stewart on the Honda SMT Wilcock Racing machine, as the helicopter above starts to head off in the direction of Union Mills to follow the front runners. Any semblance of order is broken by the deafening, but beautiful sound of the Norton ridden by Ian Mackman. It’s a truly remarkable tune and captivates the watching crowd. Team-mate Dan Hegarty follows suit as a crescendo of sound rattles the grid from the Norton orchestra. With the opening lap well underway, Michael Dunlop takes very little time in placing his flag firmly in the ground and stating his intentions for the week very clearly. The Honda TT Legends rider was setting a blistering pace and on the limit as he carved out seconds on his closest rivals. 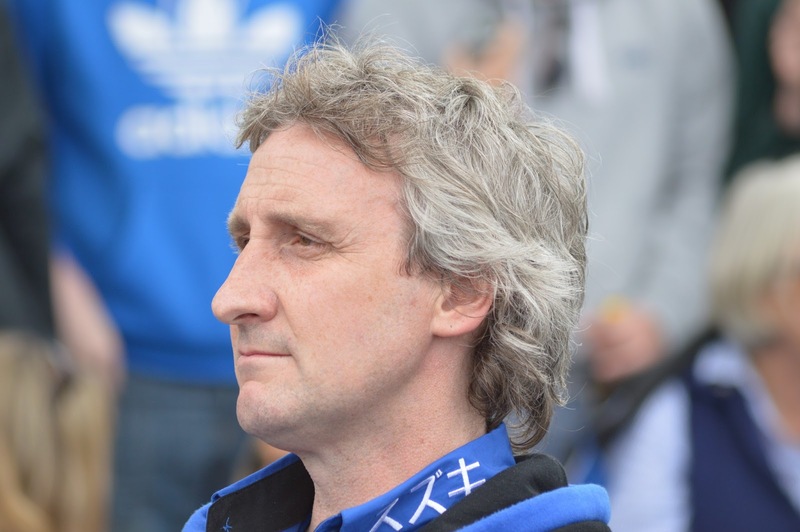 It was a race for records as Tyco Suzuki rider Josh Brookes became the fastest newcomer in the history of the race eclipsing the previous record held by Steve Plater. 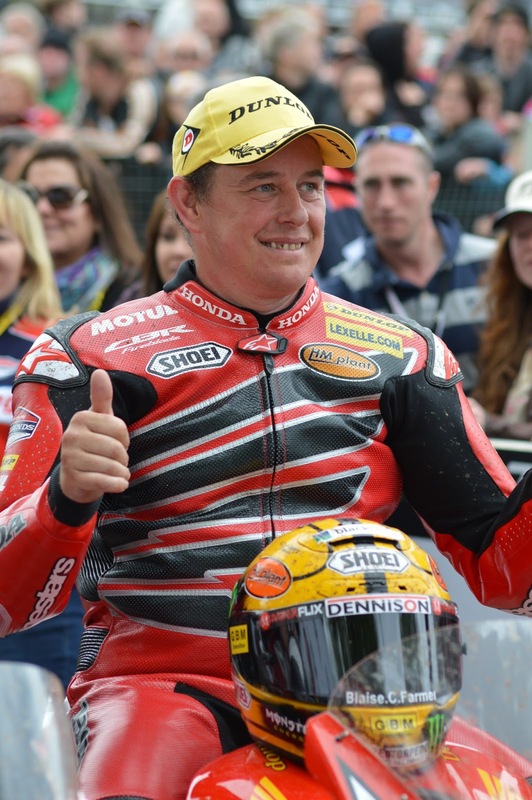 At the same time ‘King of the Mountain’ John McGuinness may not have been able to match the early pace set by Dunlop, but the forty-one year old set a new all-time record lap of 131.673 mph. Despite a sixty second penalty for a pit-lane infringement, McGuinness was far from surrendering the TT Crown to the ‘Young Pretender’ and pulled upon his formidable experience to pull back the final podium place, stealing it from Guy Martin on the Tyco Suzuki on the final lap. 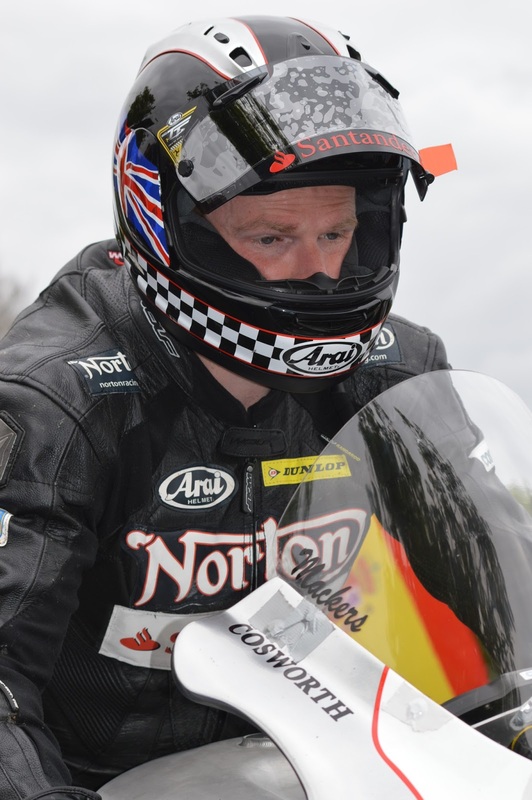 There was huge disappointment for Gary Johnson after a promising opening lap where he led the Ballymoney man only to run out of fuel at the Nook, some three-quarters of a mile from the pits. The penalty for McGuinness had moved Cameron Donald into second place, with the Australian saying later that this was the most hard-fought second place of his career. But as tributes were being paid to the late Joey Dunlop, it seemed only fitting that the Dunlop name would win the opening race of TT week. 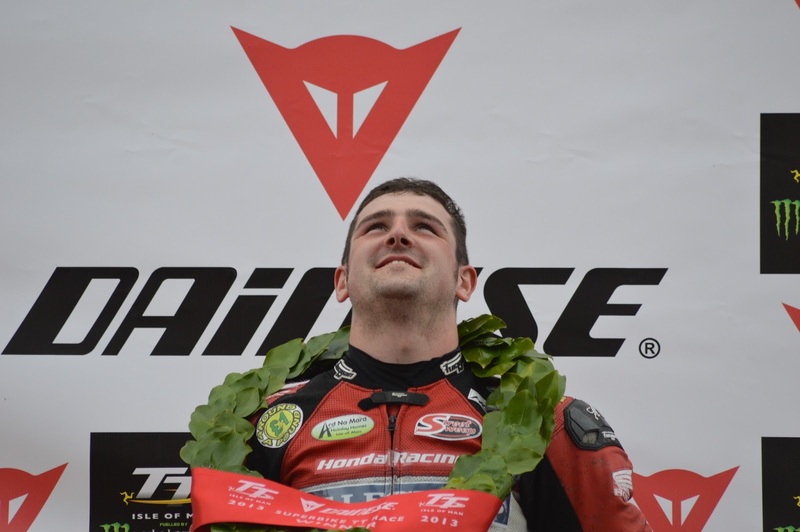 A proud moment for the Dunlop family, no doubt, as the Dainese Superbike TT race delivered a truly amazing spectacle. For a race week opener, this was epic. It was the start of things to come and as the Young Pretender staked an early claim on the title, the questions were already being asked around the paddock. A jubilant and very confident Dunlop graced the press at the post race conference. Arrogance was a thing of the past. 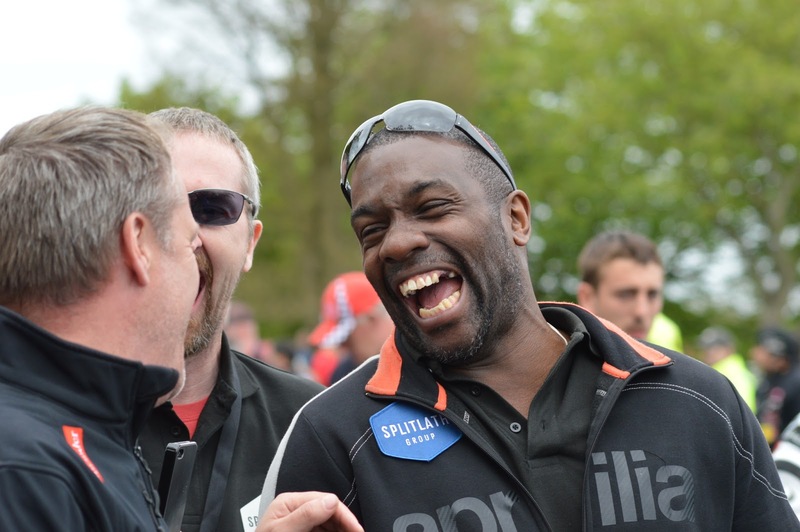 Positivity was high and the Ballymoney man had struck first blow in TT 2013. McGuinness, the ever consummate professional, congratulated his younger TT Legends team-mate on his victory but disappointment was evident, if not only for the fact that he would have wanted the win to add to the memory of Joey. A win in his name, wearing the Joey livery would have been fitting but it was not to be, albeit that it was a Dunlop on the top step of the podium as overall winner. 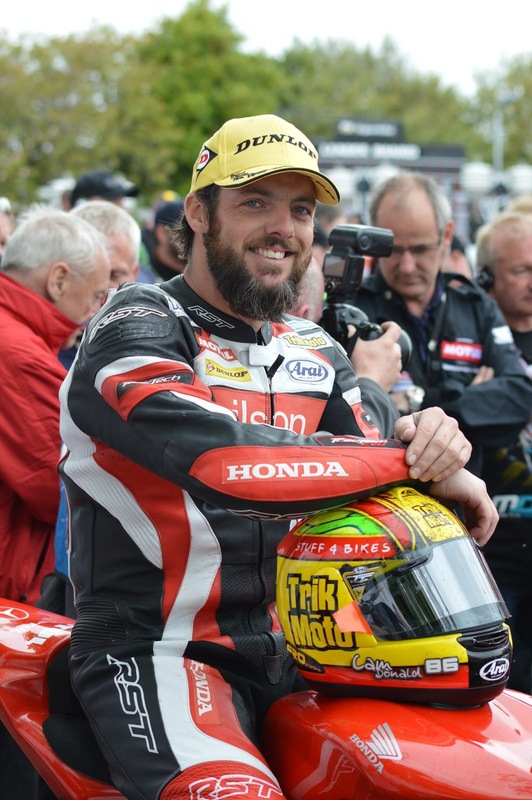 Cameron Donald appeared more than happy with his second place, as did Wilson Craig who was already planning an evening at the Sir Norman Wisdom bar in Douglas. For an opening sermon at the church of road racing, let’s just say that the week was off to a truly electrifying start. Amen.